Every business needs optimized processes. We’ve proven that again and again on the Process Street blog. However, since business process management is taught formally in academies, the available material usually consists of dense technical documents and complex case studies. When you’re just getting started, it’s easier to absorb information in the form of video than it is to pick through a lengthy paper full of cryptic diagrams. With that in mind, we decided to collect the best video lectures and interactive courses on everything related to the inner workings of business: scaling, improving consistency, lean operations, Six Sigma, BPMN, process management, and more. This list has both advanced and introductory courses. So, whether you just want to learn how to improve a process, or you want to dive into the statistical models behind business efficiency, it’s all here. Many institutions offer open courses for free online, so you can learn from the best minds without committing time or money. With these courses, you can learn process management basics, business administration, BPMN, and other fields that will help with the operational efficiency of your business. This 12-hour course is one of the internet’s most popular open courses for business process management. While it isn’t a short course, it does offer a comprehensive step-by-step breakdown of the fundamentals of BPM. The course covers process identification, discovery, analysis, improvement, automation, and monitoring. But, it doesn’t drop you in at the deep end. It starts with the basic question of “what is a process?” and works all the way up to the techniques and tools used for creating mapped, optimized, and automated processes. While all the material for the course is available for self-paced learners, it’s also periodically offered as a MOOC through the University of Queensland. Business administration is a more of a general field than BPM, but it includes many of the same goals, including effectively managing operations and improving business efficiency. This course, directed by Ross Gittell for the University of New Hampshire, goes into detail on the topics of continuous improvement, total quality management, and process optimization. 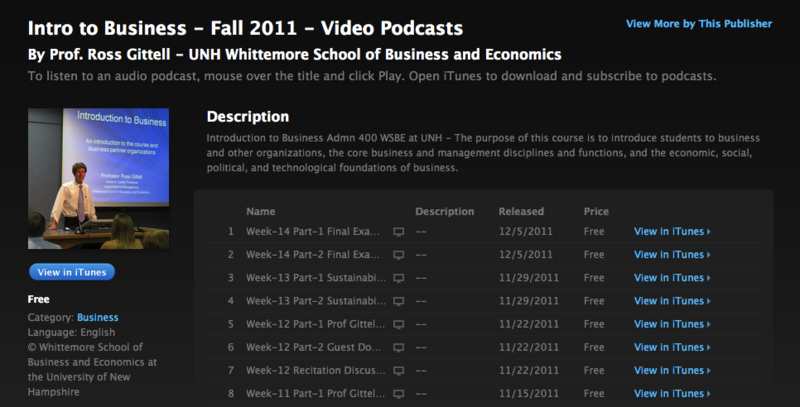 The course isn’t on YouTube, but it can be downloaded through iTunes and played on any computer or iOS device. Business Process Model & Notation (BPMN), created by Object Management Group (OMG), is the most widely accepted method of creating process diagrams. But, in the words of one of OMG’s employees and certified experts, it’s difficult to understand. The manual is over 500 pages long, and goes deep into concepts you don’t need to know as a beginner. This course, offered by Zbigniew Misiak of BPMTips.com, consists of 25 minutes of video and three bonus activities. It’s a simple introduction that will help you learn to create and maintain business process diagrams without learning hundreds of complex theories. No matter how big the organization, a change to the familiar and accepted process can cause a chaotic ripple effect. Businesses will always need to re-engineer their processes as they scale, but how do you manage and implement this change? This free Alison course on change management goes step-by-step through the theories behind change management and the methods you can use in your own organization. The course will only take two or three hours to complete, and it comes with an assessment at the end. The set of methods which Six Sigma encompasses helps businesses improve their processes by focusing on reducing the number of errors. This could be manufacturing errors, communication errors, or any kind of breakdown in the expected operations of your business. While Six Sigma comes drenched in its own biased philosophy, it’s a battle-tested set of scientific principles you can apply to any kind of process, and well worth learning to get a grasp on systems thinking. If you’re interested in Six Sigma concepts, we also have quite a bit of material on the Process Street blog, including explanations on the Deming Cycle and DMAIC. These courses are listed in order of complexity. Originally taught over a 4-week period in January 2012, the Introduction to Lean Six Sigma Methods course by MIT is led by Prof. Earll Murman, Emeritus Professor of Aeronautics & Engineering Systems at MIT. 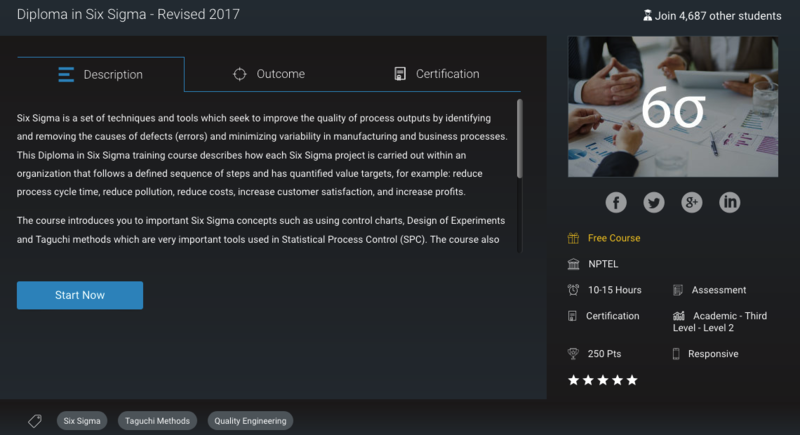 The course uses a running example of an aircraft manufacturing plant throughout to show how Six Sigma can incrementally improve the efficiency of your business, no matter how complex your operations might be. Also included are lecture notes, activities, and PDF files of the course’s reference material. You can get all of the supporting material here, or click below to start watching the lectures on YouTube. Alison hosts a wealth of business courses, all of which are open and offered for free. Unlike a lot of the courses on this list, however, this one includes an actual diploma certification. Studying the concepts behind Six Sigma is a great way to scientifically improve your business processes and quality of service. The course covers proven methods you can use to design efficient systems, analyze the way your business operates, and cut down on mistakes — both in the fields of manufacturing and operations. The course is created by NPTEL, a project from the Ministry of Human Resource Development offering over 1,000 free online courses. If you’re looking for an even heftier Six Sigma program, this one from the Indian Institute of Technology is a 40-hour behemoth which doesn’t leave any of the details out. The course is split up into chunks, covering quality management, probability & statistics, ISO 9000, project management, business metrics, and, finally, how to implement Six Sigma in your business. The tuition is clear and simple, even for such an advanced course. However, if you’re just starting out it might be better to look at the MIT Lean Six Sigma course or the Alison Six Sigma diploma — both of which are less than half the length. You can see transcripts of the videos and additional notes here, or click below to open the full course playlist on YouTube. Learn to design and control business processes with these courses in operations management. The two courses in this section are on the advanced end of the scale, and are concerned with the mathematical models at work behind the scenes of organizations. 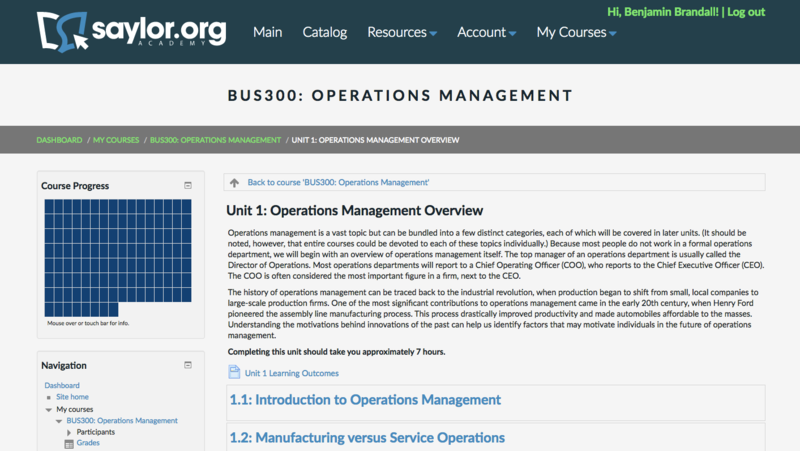 This Saylor course on operations management is rather dense and long (79 hours is their estimation), but it will give you a complete overview of operations management, from the history of the field to its practical applications in your organization. The course is presented as a series of documents and activities, but doesn’t come with lectures — you’ll need to take an active learning approach with this one. The course teaches you how to design systems, implement lean methodology, and tune up your inefficient business processes with a variety of proven techniques. As you might expect from a 40 hour course on operations and supply chain management, this lecture series is extremely deep and mathematical. It covers inventory management, resource planning, productivity, and the science behind the whole manufacturing and distribution process. It’s comprehensive, but it’s not for beginners by any stretch! You can get PDF transcripts for available every lecture over at the official NPTEL site here, or click below to start the series on YouTube. Strict processes sound counterproductive in the context of startups, but the truth is that they underpin the way every business works, regardless of size. And, since startups have seen such success in recent years, there’s a wealth of advice from phenomenal startup founders available for entrepreneurs, provided by some of the world’s most respected institutions. Presented by LinkedIn founder Reid Hoffman and featuring guest appearances from the likes of Sam Altman and Eric Schmidt, this course on scaling a startup lays the foundation for a process-driven and futureproofed business. Every lecture is packed full of inspiring stories and actionable methods that examine one business’ journey from inception to success. Each lecturer has built effective processes from scratch and dealt with the effects of explosive growth without going off the rails. While the course isn’t explicitly about business processes, you get an insight into the marketing processes behind Mozilla, the hiring process at LinkedIn, and the product development process at VMWare. See the class notes and essays related to the course on Medium here, or click below to start the video lecture series. In 2014, startup incubator YCombinator assembled a Silicon Valley all-star cast to put together this 20-part course on how to start a startup. Two lessons — How to Operate and How to Manage — are of particular interest for those looking to improve their business process expertise, but the entire series is vital material for all early-stage companies. The lectures cover every aspect of startup operations, from building an MVP to scaling it for enterprises. The course’s recommended reading is available here, and this page contains a list of resources and the course’s ebook companion. 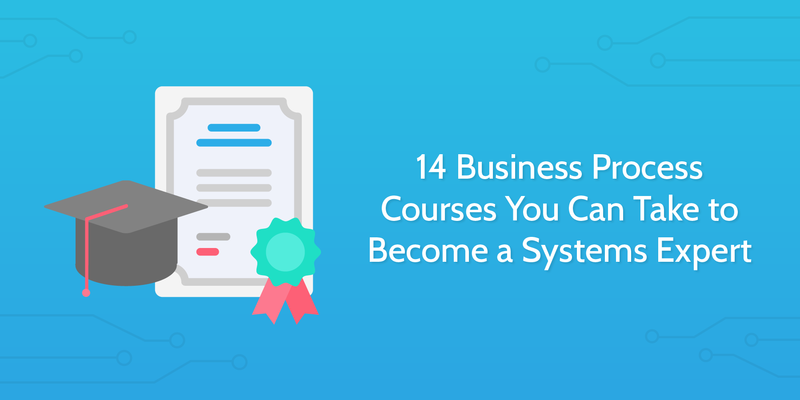 Almost every course on this list is available for free, but there were a few exceptions I decided to include because they are of particular value. Some of the free courses are dense or advanced because they are created for degree studies. These free courses on Udemy, however, are great for beginners. Requiring only a basic knowledge of business principles, this 2.5hr course is great introduction for students looking to get a grasp of BPM fundamentals before moving onto something heavier. The course was developed by Stephen Mather, a process consultant and the creator of ProPeC, a method for process improvement. You’ll learn how processes impact business goals, how to create a Gantt chart, how to analyze your existing processes, and more. When this course says “introduction”, it’s serious. Unlike MIT’s introduction to Six Sigma (14 hours total), this course is just 90 minutes long. 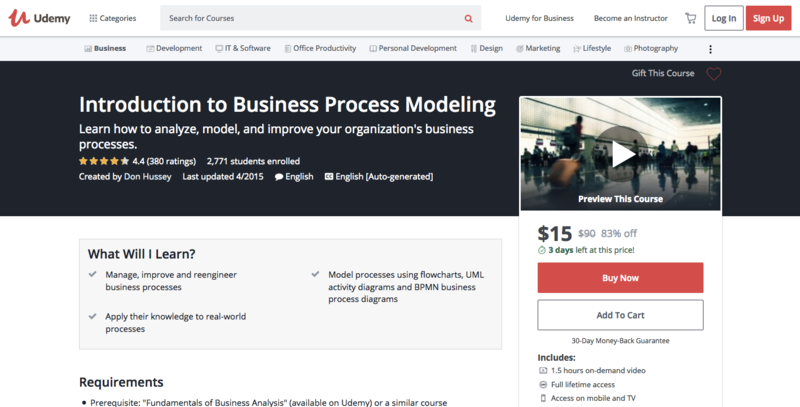 Within those tight constraints, the course manages to give a good overview of business process modeling, techniques for process management, and how to create standardized flow charts. Don Hussey (the course’s creator) is the ex-senior vice president in charge of business analysis at Citi Bank, and boasts 15 years of experience with process management. This 9-hour course, starting from the absolute basics, will equip you with the skills you need to analyze, document, and improve business processes. It’s positioned as a starting point for those wanting to kick off a career in business analysis, but the teachings are relevant for anyone that wants to adopt a process-driven mindset for their business. Would you prefer a simple written guide? 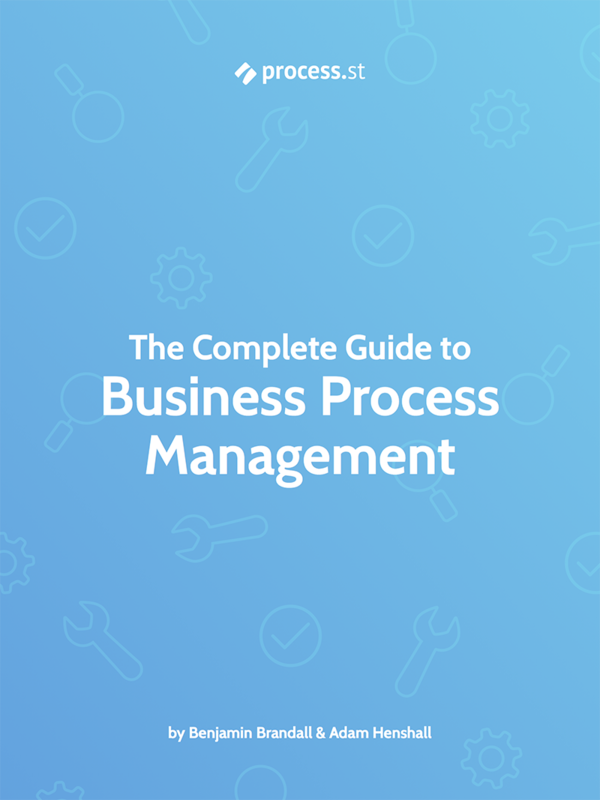 Download our free ebook on business process management below, and learn everything you need to get started.